In December 2015, a new CCC website was launched! Learn more here. 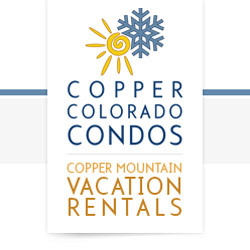 Last month we launched an all new website for Copper Colorado Condos (CCC), an absolutely fantastic (and in our potentially biased opinion, the best) vacation rental/lodging company located at Copper Mountain Ski Resort. Follow the design of the new logo, our copywriter Dan got to work on the development of a Unique Value Proposition (UVP) for Copper Colorado Condos. A UVP is a short, clear explanation that tells potential customers why they should choose you over the competition; it immediately sets you apart by stating what makes you meaningfully different and better. Though they had a track record of outstanding customer satisfaction and return rates, and though they understood that their customers and prospects care about price, location, and views most, CCC struggled when it came to articulating their uniqueness. They weren't sure how to position themselves against their competitors, though they knew they didn't want to compete on price. This left us to explore location and views. Although superior customer service was a driving factor in the company's ongoing success and continued growth, it's an intangible factor that competitors were claiming. Ongoing exploration uncovered an interesting observation: every single one of CCC's Copper Mountain properties offered coveted mountain views and convenient access to the ski slopes. While competitors could claim some of their units offered these benefits, no one else could claim all of their units did so. 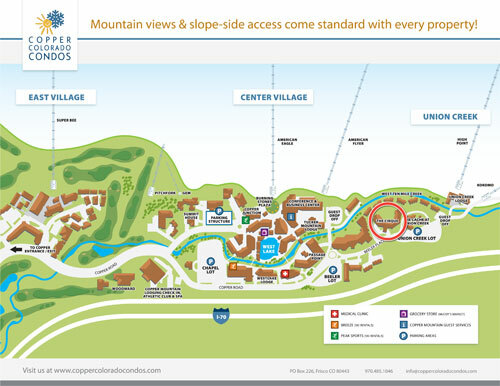 Dan continued to evolve and refine his ideas until the final CCC UVP was born: "Mountain views and slopeside access come standard with every property." Not one of CCC's competitors can match or come close to this UVP's promise, which instantly appeals to the main desires of nearly all CCC's prospects and customers. The UVP immediately and concisely positions CCC in a compelling manner. Next we designed a series of custom, branded maps of the Copper Mountain Village/Resort area for CCC to provide to its guests. The maps provide a birds-eye view of the ski resort's base area and lodging areas, highlight key places of interest (like ski rental shops), and pinpoint the individual lodging units' locations so guests can easily find their way to their condos. 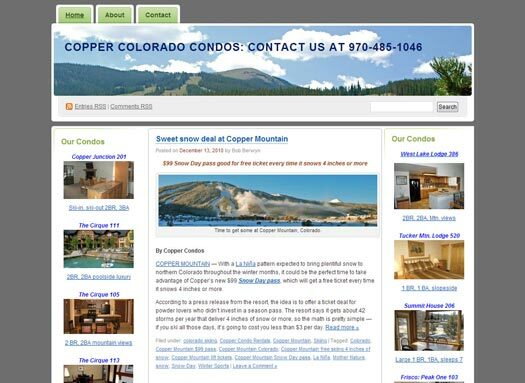 After the logo, Unique Value Proposition, and lodging maps were completed, it was time to focus on rebuilding the Copper Colorado Condos website from the ground up in the ExpressionEngine CMS. 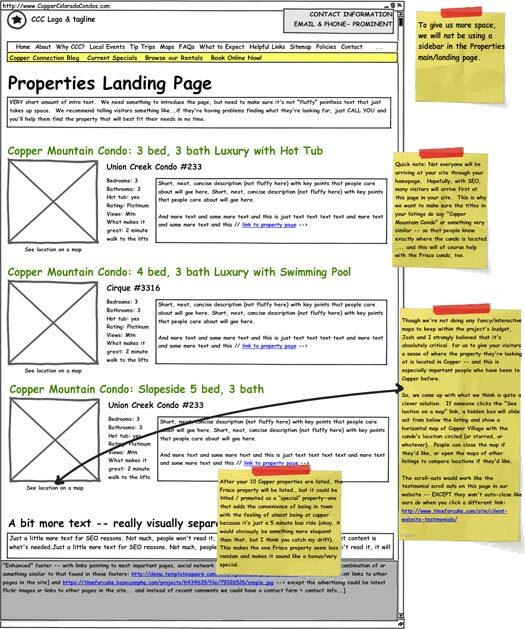 First things first: we focused on content and developing a new, organized, intuitive site architecture that would allow prospects and guests to quickly and easily locate the exact information they cared about most. At this early stage in the website rework project we also conducted keyword research to determine which keyword phrases CCC should target in the new site's content. 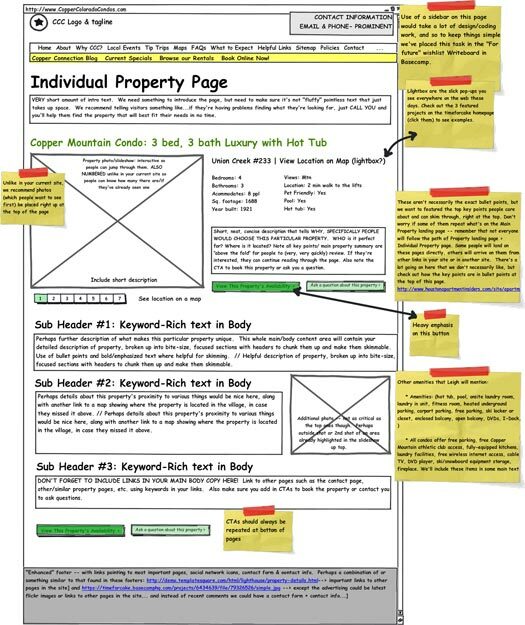 After determining what content belonged in the new site, we worked to strategically map out where the content would live on key pages in the site through the use of wireframes. 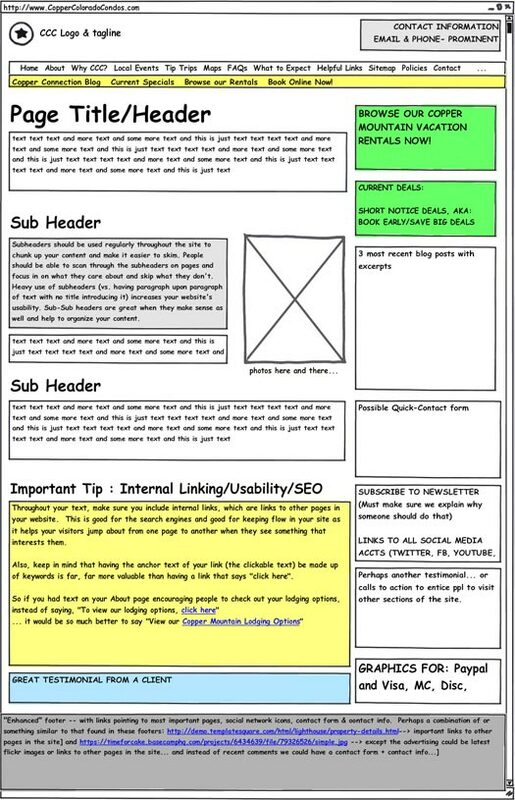 Wireframes are similar to web page "skeletons" that show web pages' basic structure and content organization. 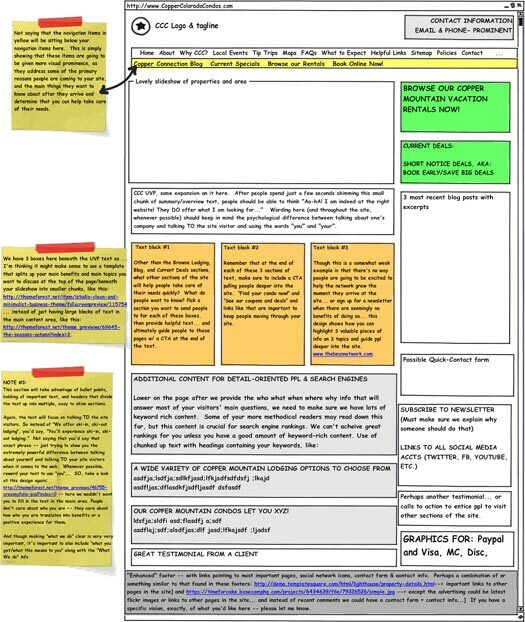 After mapping out the pages' wireframes, everyone was on the same page in terms of what content went where, and what needed to be designed. CCC then went to work on generating the new site's content and we went to work on the new site's design. To reduce costs, we located and purchased an attractive, pre-designed website theme that reflected the general direction of what the company wanted their new site to look like. Using the theme as a general foundation, we then created a semi-custom design for the new website. Nearly all the design's elements and individual features were individually redesigned in-house to the point where the final design had only a few similarities with the original theme. To view the all new website and see the new design in its entirety, visit www.CopperColoradoCondos.com.